Instagram is finally available for Windows Phone. Now it is possible to install the application in Windows Phone devices such as the Lumia 1020 or the new Lumia 1520. 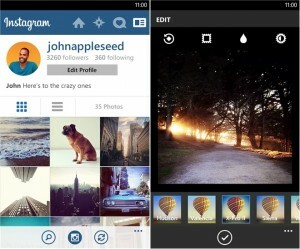 A few days ago, Instagram announced the release of its app for Windows 8 devices. However, the app is not completely ready and it’s still in beta version. It’s been a long wait for Windows Phone users, and when the app finally appears on the Windows Store, half the features are still missing. Basically, this beta version lacks photo tagging and video recording. However, you can see tags and videos taken by iOS and Android users. If you have a Windows Phone, the possibility to see the tags and videos taken by other OS users only makes things worse, as it highlights your inability to do the same things. In the same line, if you check the Windows Phone Store, the description announces the possibility to record videos, but they are not yet available. Another missing feature from this Instagram version is the ability to shoot photos from de app. In iOS and Android versions of this app, the users can take photos directly from Instagram. However, with a Windows Phone, you need to take the photo with its corresponding camera application and upload their photos later. So, you need to spend a little more time to finally have your recently acquired images into the app. It’s not clear why Instagram takes so long in getting a good Windows Phone app, without so many differences with iOS and Android versions. However, as Windows Phone market is a much smaller one, the priorities of the company might not be focused in this market niche. If you want to try this Instagram beta version, you can find it on the Windows Phone Store.